Well, at least I was right about one thing: it didn’t take the Brewers long to score against Josh Collmenter. Corey Hart led off the third with a home run to left. Unfortunately that was all the scoring the Brewers would do in Game 3 of the NLDS. The D’Backs weren’t quite so tame, though, in what was one of Shaun Marcum’s worst starts of the year. 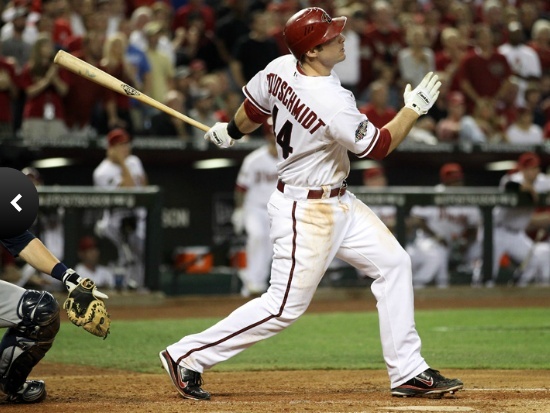 Miguel Montero and Paul Goldschmidt each knocked in a run in the first, Montero added another in the third, and in the fifth Goldschmidt grooved a two-strike fastball into the seats for the D’Back’s first franchise postseason grand slam. But we’ve so often talked about defense with these two clubs, and that again was what really cost the Brewers the game. The team had multiple opportunities to end the fifth before Goldschmidt even came to the plate, but Nyjer Morgan badly misplayed a ball to straightaway center field and Marcum dropped a tailor-made double-play ground ball. A throwing error by Jerry Hairston, Jr. extended the inning and allowed the D’Backs to plate one more run to end the scoring for the night. The D’Backs appeared to be testing their luck at the plate against the left side of the Brewers’ infield, as Yuniesky Betancourt had more balls hit his way than I can remember so far in the series. He fielded most of them well, though, but you have to worry that Arizona will continue to try to exploit the Brewers’ weak left side. Perhaps Kurt Gibson, widely expected to run away with the NL Manager of the Year award, has found this club’s Achilles’ heel. Randy Wolf gets the ball tonight for the Crew. Career versus Arizona, he’s 10-5 with 110 strikeouts in 128 innings, all of which are fine. The problems are his 51 walks, 1.39 WHIP, and 4.64 ERA. Wolf lost against Arizona his last time out, but gave up only two runs over 7 1/3, which, if replicated, I would be more than happy with. His opposition, Joe Saunders, has not won a game in two starts against Milwaukee and owns a 5.68 ERA versus the Brewers. This entry was posted in News and tagged 2011 NLDS, 2011 Postseason, Arizona, Brewers, Diamondbacks, Jerry Hairston, Joe Saunders, Josh Collmenter, Jr., Nyjer Morgan, Paul Goldschmidt, Yuniesky Betancourt. Bookmark the permalink.